This adorable Cuddlekins stuffed bald eagle is both cuddly and majestic with its soft dark brown fur, white head and tail, and yellow accents. 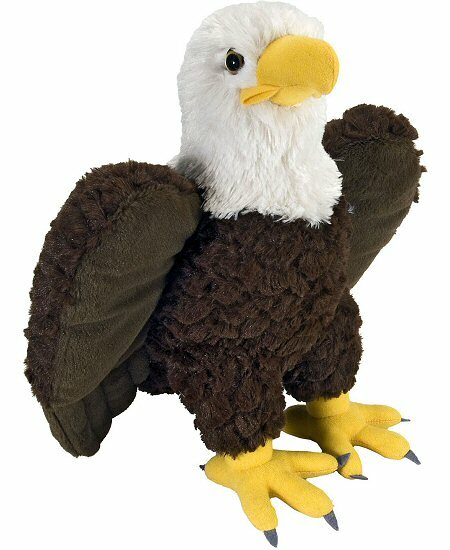 With softly clawed feet and wings ready for flight, this Cuddlekins plush bald eagle has been designed with nature and education in mind. In fact, did you know that bald eagles aren't bald at all, but its distinctive white head gives it a very distinguished look. Its name comes from the old English word "balde" meaning "white." Bald eagles lives near open water in every state of the USA except Hawaii. One of the largest American birds, this bald eagle is very proud to be the national symbol of the United States of America. A portion of the proceeds from the sale of this magnificent Cuddlekins stuffed bald eagle helps to provide housing and education for disadvantaged children, as well as protection for abandoned animals throughout the world.